André, a Californian Sea Lion, used to be housed at Chessington, but they were looking to re-home him, and got in contact with the Sanctuary. The sanctuary made preparation for his arrival and on the 5th of May 2009, André arrived at Gweek. 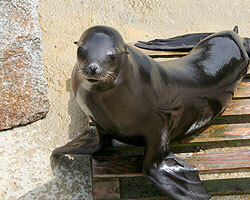 Sunny, a Californian Sea Lion, was born at Wuppertal Zoo in Germany on 27th June 2012. He was being bullied by his older sister and the Zoo was wondering what to do, but then the Zoo heard that the Cornish Seal Sanctuary was looking for a pool partner for André. Diego, male Patagonian Sea Lion, was born in a marine park in Valencia, Spain on 1st July 2005 and joined the Sanctuary family in March 2009. Noito, male Patagonian Sea Lion, was born on 1st July 2005 in a marine park in Valencia, Spain, becoming a resident at the Sanctuary in March 2009.